Wow. There are so many things I thought about while I read this book. Surprisingly, I didn't cry (which I tend to do with books dealing with grief), but felt very introspective. I think that's due to Autumn's detached observations, her coping mechanisms, and the deep questions she and other characters wrestled with. The book started a bit slow for me as things began to unfold and be revealed, but the pace steadily picked up and I appreciated the time I was able to take with each level of Autumn's reemergence into a functioning life. The part that hit home to me personally was when Paul was reflecting on how his children had grown. It made me think of my relationship with my own 10 year old daughter and how I can preserve our bond and sense of unity that seems to come so naturally when they are younger. "There were moments when Reese still seemed so young and innocent, but even more moments like the one he experienced with Tate as he carried him up the stairs, only instead of her weight or height catching him off guard, it was her... apartness. There were more and more pieces of his daughter that were becoming a mystery to him. It filled Paul with the same sense of alarm that it had with Tate. The same sense that if he didn't grab something quick, this monumentally important thing would slip away." The book explores many angles of the timeless question of why bad things happen, or why God allows bad things to happen. The thoughts and processes of the characters were natural and realistic, and I loved the profound conclusions they came to as they interacted with each other and learned from the insights shared. Autumn's developing relationship with the Elliot family brought light and hope to her, them, and to the overall story. I especially enjoyed 6 year old Tate and his mannerisms- he practically jumped off the page! 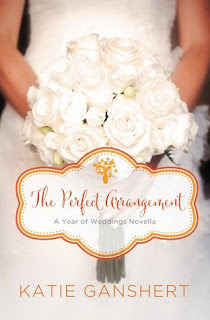 I didn't expect a romance to come out of the circumstances, so it was a pleasant surprise, especially when I wasn't sure if I should be rooting for Seth, Autumn's former fiancee, or Paul, who was dealing with more baggage than he could handle. 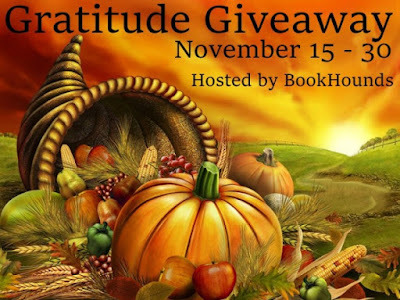 The extended family of Autumn and Paul play important roles that illustrate the variety of family situations, the imperfections, and the love and loyalty we share in spite of it. The way the author wove so many aspects and themes together is beautiful and I highly recommend this novel! New Pre-order Extras for Life After by Katie Ganshert! 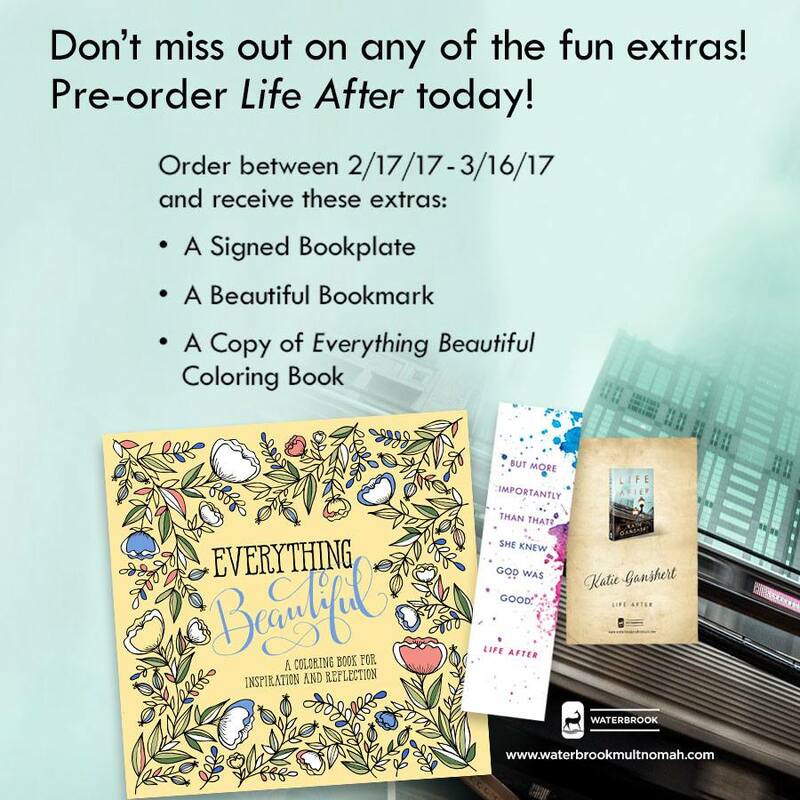 Check out this great pre-order deal from Life After's publisher Waterbrook Multnomah! 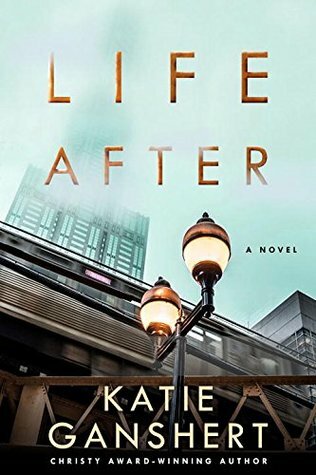 I'm so excited for Life After by Katie Ganshert! 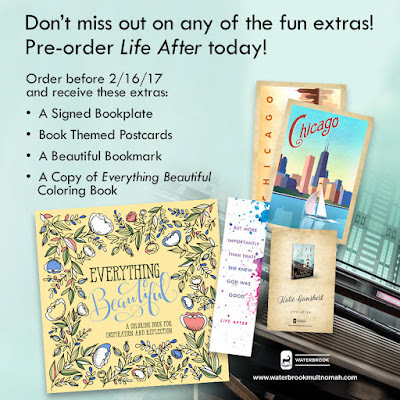 Each month before the book releases there will be a different package of extras for those who pre-order! My favorite thing about this novella is the letters Amelia and Nick exchange online- they are full of honesty, quirkiness and a love for classic films. The cuteness totally reminded me of the movie You've Got Mail (except they are not enemies in real life) and they even reference The Shop Around the Corner which it's based on. Amelia is the perfect balance of hot mess and capable businesswoman- completely lovable. The fact that she runs a flower shop is absolutely perfect- it's one of my future dreams :) Nick seems too good to be true, although he does tell Amelia some of his shortcomings in his emails. He quickly grows to adore Amelia, but is also charmingly hesitant about pressuring her to meet. Their real-life interactions are full of tension and chemistry, and their mannerisms make the story come to life. 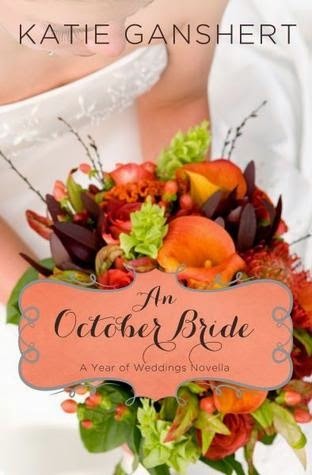 Definitely one of my favorites from the Year of Weddings novella series! 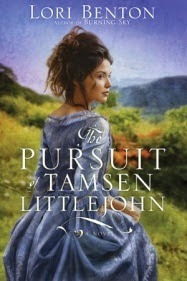 Western North Carolina, 1787 ~ To escape a threatening stepfather and an unwanted marriage, Tamsen Littlejohn enlists the aid of Jesse Bird, a frontiersman she barely knows, to spirit her away from Morganton, North Carolina, west beyond the Blue Ridge Mountains. Trouble pursues, as the two men intent on seeing her recovered prove relentless in their hunt. Trouble awaits in the form of a divided frontier community. Across the mountains the State of Franklin has been declared, yet many settlers remain loyal to North Carolina. Chaos reigns, thwarting Tamsen and Jesse’s hastily cobbled plan to keep her safe. With her pursuers ever nearing, the region in turmoil, neighbors grown suspicious of her presence, Tamsen’s safety is soon put in greater jeopardy. Gaining the freedom she longs for will mean running yet again, to the most unlikely refuge imaginable—the Cherokees, a people balanced on the knife edge of war. But the biggest complication may prove to be Tamsen’s growing bond with her knight in greasy buckskins, Jesse Bird. Falling in love was never part of the plan. 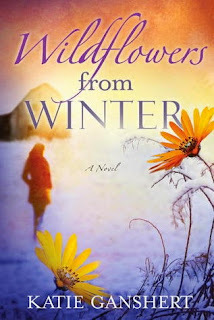 Only $1.99 to download Wildflowers from Winter by Katie Ganshert! I haven't read this book yet but it's been on my wishlist so I am thrilled it's on sale! LOVED it! 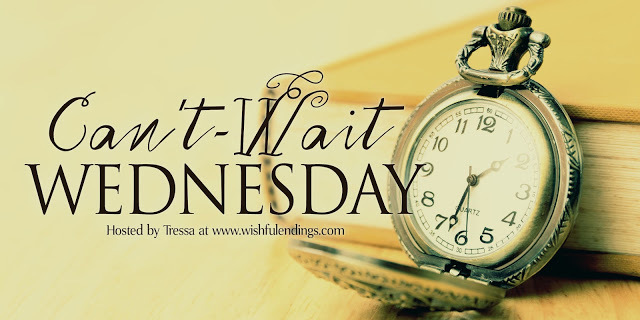 This novella is well-written, the main characters have amazing chemistry and romantic tension, and the heart-breaking storyline of a dying father is one that always gets me since I can relate to it all too well. It was so enjoyable to see Emma and Jake realize their feelings for each other and the ending is just perfect... definitely my favorite from the Year of Weddings collection!